Which Blue laid the best tackle in 2015? 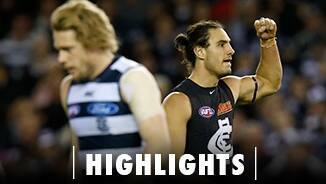 Watch our top-five tackles and have your say! Young forward Troy Menzel struggled to find consistency and confidence in a season hampered by injury. Who will be the 2015 John Nicholls Medallist? Forward Troy Menzel says the Blues must be "switched on" for four quarters when they take to the big stage against arch-rival Collingwood on Saturday. After being selected as Carlton’s first-round pick in the 2012 National Draft, Troy Menzel gave Blues fans a glimpse of his exciting future with an eye-catching 2014 season. The 20-year-old bagged 26 goals from 18 games, earning a Rising Star nomination and establishing himself as a regular in the forward line. One of the favourites among the Blues faithful, Menzel will be looking to make a huge impact in 2015. 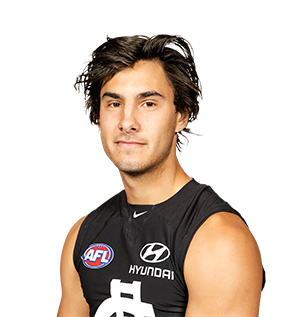 Draft history: 2012 NAB AFL Draft 1st round selection No.11 overall.